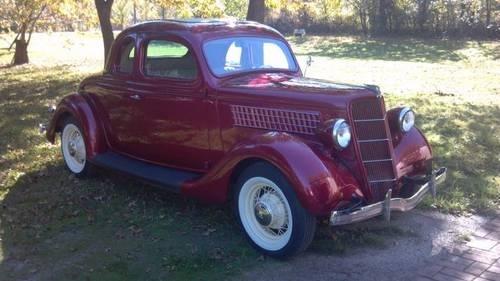 1935 Ford 5 Window Coupe, 283 V-8 Chevy motor, 39 Ford transmission and rearend, original front suspension, wheels, etc. Actually a pretty original car besides the Chevy motor, and it is not buthered up so it wouldn’t take much to put a flathead V-8 back in it if that was your thing. It does have hydraulic brakes, but the conversion could use a little finish work, whic is the first thing I will be doing to it. I just received this car from the family of the older gentleman that had owned it for years and haven’t had time to sort it out yet. It runs good, front end seems tight, brakes need some attention,. The car was repainted some time ago, still looks good, It was a high quality paint job, still shines real nice but has some nicks and chips here and there. Tweed interior appears to be fairly new and looks good. It appears to be a good solid car that, like just about every old car that I buy, needs some little things cleaned up, and done right, like some wiring, although everything works, and the brake lines although it does stop , proper fasteners, etc, or in other words, redo a lot of what the previous people have done to the car, and it will be a nice driver, which is exactly what I am going to do just as soon as I finish putting the 4 speed overdrive in the 56, and the price will be going up accordingly, but until then, it is only $21,900, which is very likely the best deal you will find anywhere on a sharp looking running driving 35 Ford Coupe. Too late, and you really were too late on this one. It just goes to show how cheaply I sell these old cars. I sent this Coupe to an auction where it brought $27,250, and was purchased by a dealer to resell. After adding buyers premium, the dealer paid $29,430!! and you could have owned it for $21,900!!! Now pick out another one here and buy it before it’s too late again.